Mattel and WWE have just officially released their 62nd wave of Elite action figures. This set of action figures are some of the most detailed and stunning figures yet. The lineup this time around consists of two WWE Hall of Famers and four current members of WWE's roster. Dude Love - After years of waiting, Mattel fans can finally complete the 3 faces of Foley with the first-ever Dude Love figure from the toy company. Mick Foley's newest figure includes a wild headsculpt with an accurate shirt. He does come with a removable headband and sunglasses though. Expect this figure to be one of the most popular in the series. Roman Reigns - "The Big Dog" also has an updated Elite figure in the series. The current Universal Champion has a new removable vest and also comes with the Intercontinental Championship title that he held onto last year. Sting - Based on his "Surfer Sting" days, this Sting figure sees the former world champion sporting blonde hair and accurate ring attire. He has a green, black, and gold entrance jacket with tassels hanging down from each arm. Of course, Sting's face is painted, and he also comes with the WCW World Heavyweight Championship. 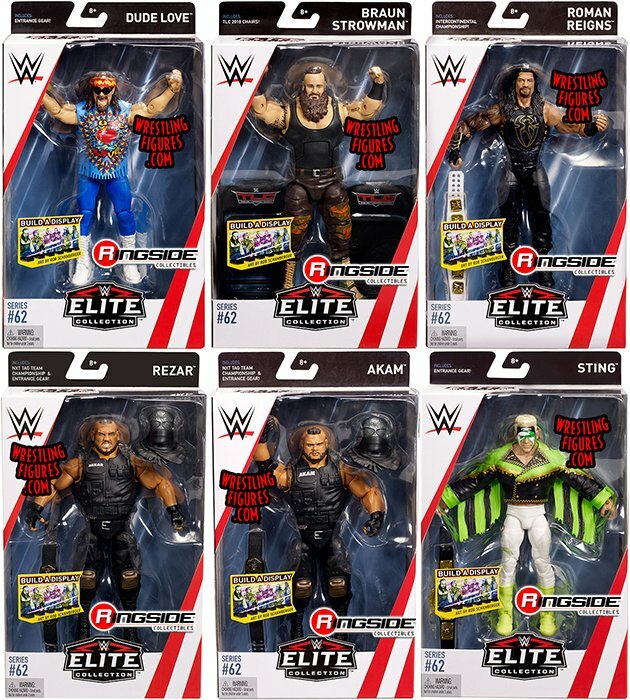 Akam - This Raw Superstar receives his first-ever Elite figure in this set. Akam has a snarling headsculpt and is made in black wrestling gear. He has an entrance vest with his name on it, and he also includes the NXT Tag Team Championship and a removable mask. Rezar - Much like his tag team partner from The Authors of Pain, Rezar perfectly matches the Akam figure also included in this series. Rezar also has his own vest and removable mask. He also has the NXT Tag Team Championship, meaning that the dominating AOP team can now be added to any collection. Braun Strowman - The fan-favorite "Monster Among Men" returns with a new Elite figure based off of his appearance at TLC 2017. Strowman has accurate ring gear and tattoos on both arms. He also comes with two chairs from the Tables, Ladders, and Chair pay-per-view that he competed in last year. All figures from Elite 62 include a photo created by artist Rob Schamberger. Elite 62 can be viewed or ordered here.